1. An active force or substance capable of producing an effect. For agents not listed here, see the specific name. 2. In disease, a factor such as a microorganism, chemical substance, or a form of radiation, the presence or absence of which (as in deficiency diseases) results in disease or in more advanced form of disease. (a´jent) something capable of producing an effect. adrenergic blocking agent one that inhibits response to sympathetic impulses by blocking the alpha (alpha-adrenergic blocking a.) or beta (beta-adrenergic blocking a.) receptor sites of effector organs. adrenergic neuron blocking agent one that inhibits the release of norepinephrine from postganglionic adrenergic nerve endings. alkylating agent a cytotoxic agent, e.g., a nitrogen mustard, which is highly reactive and can donate an alkyl group to another compound. Alkylating agents inhibit cell division by reacting with DNA and are used as antineoplastic agents. blocking agent an agent that inhibits a biological action, such as movement of an ion across the cell membrane, passage of a neural impulse, or interaction with a specific receptor. calcium channel blocking agent any of a class of drugs that inhibit the influx of calcium ions across the cell membrane or inhibit the mobilization of calcium from intracellular stores; used in the treatment of angina, cardiac arrhythmias, and hypertension. 1. a compound that combines with metal ions to form stable ring structures. 2. a substance used to reduce the concentration of free metal ion in solution by complexing it. cholinergic blocking agent one that blocks or inactivates acetylcholine. ganglionic blocking agent one that blocks nerve impulses at autonomic ganglionic synapses. inotropic agent any of a class of agents affecting the force of muscle contraction, particularly a drug affecting the force of cardiac contraction; positive inotropic agents increase, and negative inotropic agents decrease the force of cardiac muscle contraction. neuromuscular blocking agent a compound that causes paralysis of skeletal muscle by blocking neural transmission at the neuromuscular junction. nonsteroidal antiinflammatory agent see under drug. Agent Orange a herbicide containing 2,4,5-T and 2,4-D and the contaminant dioxin; it is suspected of being carcinogenic and teratogenic. oxidizing agent a substance capable of accepting electrons from another substance, thereby oxidizing the second substance and itself becoming reduced. potassium channel blocking agent any of a class of antiarrhythmic agents that inhibit the movement of potassium ions through the potassium channels, thus prolonging repolarization of the cell membrane. progestational agent progestin: any of a group of hormones secreted by the corpus luteum and placenta and, in small amounts, by the adrenal cortex, including progesterone; they induce the formation of a secretory endometrium. Agents having progestational activity are also produced synthetically. psychoactive agent , psychotropic agent psychoactive substance. reducing agent a substance that acts as an electron donor in a chemical redox reaction. sclerosing agent sclerosant; a chemical irritant injected into a vein in sclerotherapy. sodium channel blocking agent any of a class of antiarrhythmic agents that prevent ectopic beats by acting on partially inactivated sodium channels to inhibit abnormal depolarizations. surface-active agent a substance that exerts a change on the surface properties of a liquid, especially one that reduces its surface tension, as a detergent. wetting agent a substance that lowers the surface tension of water to promote wetting. (in law) a party authorized to act on behalf of another and to give the other an account of such actions. Angiogenic GENe Therapy. A clinical trial evaluating the safety & efficacy of an angiogenic gene therapy, Ad5-FGF4 (fibroblast growth factor 4). Primary endpoint 1-month, 3-month exercise tolerance. Conclusion Early data indicate that Ad5-FGF4 significantly improves exercise time in treated patients. Epidemiology A factor (such as a microorganism, chemical substance, or form of radiation) whose excessive presence, or relative absence (in deficiency states), is essential for the occurrence of a disease. Health insurance An insurance company representative licensed by the state who solicits, negotiates, or effects insurance contracts and who provides services to the policyholder for the insurer. Infomatics A small mobile piece of computer software that can send itself across a computer network and perform a task on a remote machine. Medspeak A thing capable of producing an effect. Military A code term for a biological substance that can be used as a weapon of mass destruction. Nutrition A substance added to a food to change a physical property. Pharmaceutical industry An authorised person who acts on behalf of or at the direction of a manufacturer, distributor, or dispenser, not including a common or contract carrier, public warehouseman, or employee of the carrier warehouseman. VA Bd of Pharmacy, 7/97. Pharmacology Any substance capable of producing a physical, chemical or biologic effect. Virology An unidentified virus or pathogen. Clinical pharmacology An authorized person who acts on behalf of or at the direction of a manufacturer, distributor, or dispenser, which does not include a common or contract carrier, public warehouseman, or employee of the carrier warehouseman Choice in dying An adult appointed by the declarant under an advance directive, executed or made in accordance with the legal provisions, to make health care decisions for the declarant. See Declarant Epidemiology A factor, such as a microorganism, chemical substance, or form of radiation, whose excessive presence, or in deficiency diseases, relative absence, is essential for the occurrence of a disease Medtalk A thing capable of producing an effect. See Biological agent, Challenge agent, Controlled drug substance Scheduled agent, Cytoprotective agent, Cytotoxic agent, Dirty agent, Gene transfer agent, Intercalating agent, Nerve agent, Radiopaque contrast agent, Reducing agent, Reversal agent, Schedule I agent, Schedule II agent, Thrombolytic, Vesicant/blistering agent Pharmacology Any substance capable of producing a physical, chemical or biologic effect. See Alkylating agent, Antidiabetic agent, Antimitotic agent, Antineoplastic agent, Antiplatelet agent, Antipsychotic agent, Chemotherapeutic agent, Depolarizing agent, Inotropic agent, Keratolytic agent, Negative inotropic agent, Nondepolarizing agent, Positive inotropic agent Virology An unidentified virus or pathogen. See Creutzfeldt agent, Hawaii agent, Norwalk agent, Pittsburgh pneumonia agent, TORCH agent, TWAR agent. 1. An active force or substance capable of producing an effect. 2. A factor such as a microorganism, chemical substance, or a form of radiation, the presence or absence of which (as in deficiency diseases) results in disease or more advanced disease. n 1. a person or product that causes action. n 2. a person authorized to act for, or in place of, another. n a drug that blocks the action of the neurohormones norepinephrine and/or epinephrine or of adrenergic drugs at sympathetic neuroeffectors. n an uncertain term sometimes used in reference to adrenergic blocking agents. n a drug that produces local or general loss of sensation. n any medication prescribed to relieve anxiety disorder symptoms, primarily stress and insomnia. The most common forms are benzodiazepine derivatives. n compound that inhibits, controls, or kills organisms associated with the formation of gingivitis. n a medication used to lower elevated blood pressure (e.g., diuretics, beta-blockers, and vasodilators). n a drug that reduces inflammation. n a substance used to treat various nervous system and psychiatric disorders; possible effects on fetal development include sluggishness, oxygen deficiency, and physical malformations. n an antimicrobe that specifically targets pathogenic microorganisms. n an agent that occupies or usurps the receptor site normally occupied by a drug or a biochemical intermediary (e.g., acetylcholine or epinephrine). n a substance used to bond fillings and tooth restorations to the tooth surface. n a chemical of natural or synthetic origin used for its specific action against disease, usually against infection. n 1. a drug that inhibits the action of acetylcholine or cholinergic drugs at the postganglionic cholinergic neuroeffectors. n 2. an anticholinergic agent. n.pl an abrasive substance contained in toothpastes, gels, and powders that polishes teeth and aids in the removal of stains and plaque biofilm. See also abrasion, dentifrice. n.pl any substance contained in toothpastes, gels, and powders purely to make the product more appealing. 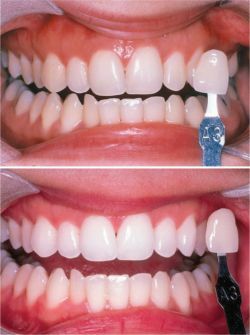 n a substance or material that binds to both resin and reinforcement material and helps join them to make a composite. n a drug that prevents passage of nerve impulses at the synapses between preganglionic and postganglionic neurons. n a drug that prevents transmission of nerve impulses at the junction of the nerve and the muscle. n an agent that provides oxygen in reaction with another substance or, in the broader and more definitive chemical sense, a chemical capable of accepting electrons and thereby decreasing the negative charge on an atom of the substance being oxidized. n an abrasive that produces a smooth, lustrous finish. n.pl a medication used to treat hypertension by blocking the release of the naturally occurring hormone norepinephrine. n a category of chemicals used in film processing that brings out the gray tones of an image by creating black metallic silver from silver halide crystals. n any agent that will reduce the surface tension of water. Generally used in investing wax patterns. Whitening agent, before and after. n a bleaching substance applied to teeth to lighten their appearance. n.pl antihypertensive drugs used to lower blood pressure, specifically those that operate by stimulating α-receptors in the central nervous system and arterioles. n one of several types of medication used to treat heart disease; alleviates pain associated with angina by lowering blood pressure during systole. See also vasodilator. n.pl the substances, such as hydrogen peroxide, that, when used as mouthrinses, release oxygen into gingival tissues and reduce inflammation. The process has not proved to reduce the bacteria causing the inflammation. Long-term use may cause tissue damage. Hence, showing that the prior coating of dentine bonding agent in- creased the shear bond strength. either through a solution obtained by solvating a mixture particularly formulated to be compatible with the rubber compound, or through the use of different bonding agents. After blot drying, all the teeth in control and experimental groups entered the bonding phase which was carried out by applying two consecutive coats of bonding agent (Adper Single Bond 2, 3M ESPE, fifth generation bonding agent) using a micro brush with gentle agitation to improve penetration Excess bonding agent was gently air dried for 3 seconds and light cured for 20 seconds with a LED curing unit (Light Emitting Diode) (Woodpecker Medical Instruments, Co. The concept of bonding agent arised from a need of a restorative material that will bond effectively to the tooth structure. There is the possibility that the military might use the research or that a developing nation could be interested because once it is developed, the bonding agents have a longer shelf life, are less expensive to produce and work quickly. For the first 10 specimens from each sub group, each bonding agent was light cured immediately after application. After this a bonding agent is added, then the EVOH layer, and then another bonding agent, and finally the PEX-B layer. In case the occlusal surface presents unwanted cavities, or pits and fissures, bonding agent (resin) is applied (without acid upon the enamel) in order to create a more favorable occlusal anatomy (fig. It combines surface restoration and a surface bonding agent to restore kitchens and bathrooms without the cost and inconvenience of complete replacements. The bonding agent only can be recycled at pH levels between 4. Welds achieved by magnetically generated heat produced when magnetic particles in the bonding agent are exposed to an RF field. EVA film becomes transparent and colorless when heated, while its waterproof nature makes it an ideal bonding agent for solar modules used outdoors.